Supper doesn't always need to be fancy or contain meat. Often breakfast dishes make great dinners and they're usually not too expensive. 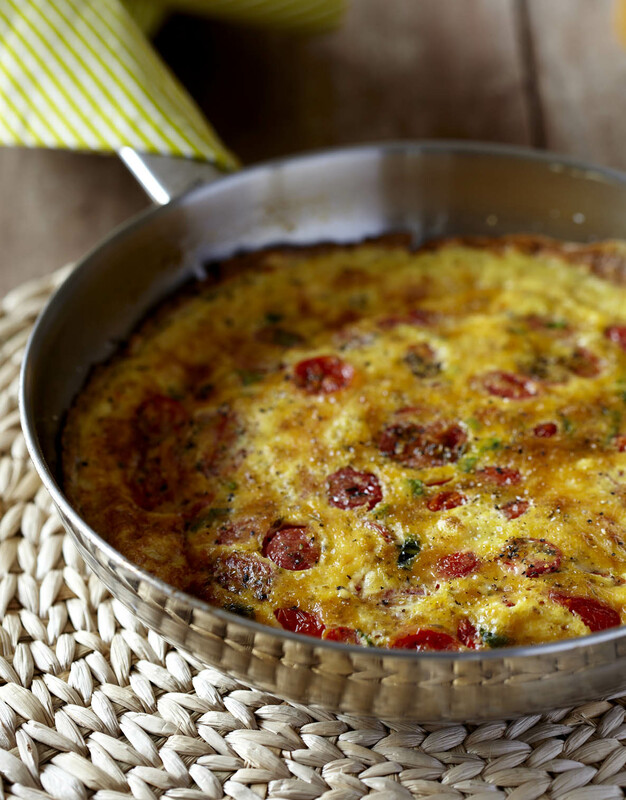 We love this simple cheese and tomato frittata that is delicious served on slices of warm, buttered toast. 1. Place the ingredients and salt in a bowl with four tablespoons of water and beat lightly with a fork until just combined. 2. Melt the butter in a small frying pan over a medium heat and pour in the egg mixture – use a frying pan with a metal handle that can go into the oven under the grill. 3. Move the eggs around (like scrambling an egg) until they begin to cook and then allow to settle. 4. Arrange the tomato slices on the omelette and sprinkle with grated cheese. Continue to cook for two to three minutes. 5. Place the pan under a preheated grill to finish cooking the eggs and melt the cheese. 6. Slide the cooked omelette onto a warm serving plate and sprinkle with freshly ground black pepper. Cut into slices and serve with toast.